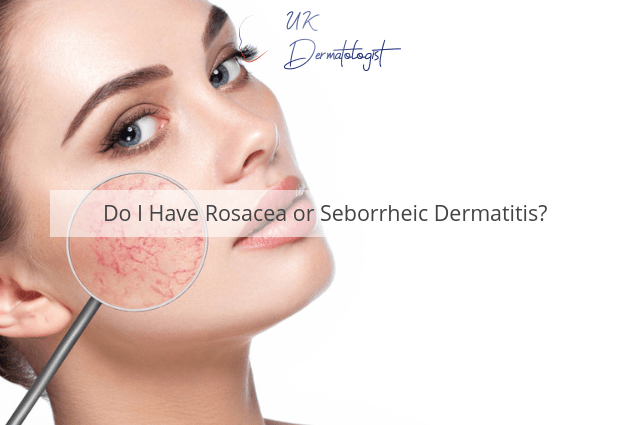 Do I Have Rosacea or Seborrheic Dermatitis? Rosacea and seborrheic dermatitis are two common skin conditions associated with inflammation, redness and itching. This is one of the reasons why they are often confusing to differentiate. While they have been known to occur in synergy with one another, there are actually a handful of important disparities to note. This is why those who are seeking professional rosacea treatment should be aware of how each is diagnosed. Let us look at these conditions in greater detail. Greasy or yellow scaly patches. One of the ways in which a dermatologist will differentiate between the two is where the patches appear. Seborrheic dermatitis is more common in specific facial regions such as the scalp, eyebrows, ear canals, and the skin around the periphery of the nose. However, one of the most important indicators that rosacea can be ruled out is that seborrheic dermatitis is not associated with any type of acne-like pustules. A final confounding factor is that up to 28 per cent of those who have been diagnosed with rosacea will also have Seborrheic Dermatitis. This is why obtaining the opinion of a trained professional is extremely important. While the conditions might not be eliminated altogether, there are several effective techniques which can be used to manage and mitigate their outer appearance. Do you suspect that you might be suffering from one or both of these conditions? If so, do not hesitate to contact a professional at UK Dermatologist. We will help to take the guesswork out of the equation. Previous PostPrevious Where Does Basal Cell Carcinoma Originate? Next PostNext How Long Will it Take to See Results from Laser Hair Removal?